Emmanuel Macron is next President of France. He surged to victory as the country’s youngest-ever president to enter Elysee Palace, after beating his rival Marine Le Pen. The 39-year-old candidate won the election with over 65% of the vote. After he was declared the winner, Emmanuel Macron promised the crowd at the Louvre Museum that he will defend France and Europe. “I will defend France, its vital interests, its image and its message. I will defend Europe, the common destiny the peoples of our continent have given themselves”. Via his twitter account, he emphasised on promoting the French values. “I will serve you in the name of our motto: Liberty, Equality, Fraternity.” No fear, no division, no falsehood was the main message on his twitter account. “People of France, we will not yield to fear. We will not yield to division. We will not yield to falsehood,” the tweets read. He told world leaders that France will uphold peace and play a key role in the most pressing issues that affect the world today such climate change and terrorism. “France will be active and mindful of peace….and the fight against global warming”. “I tell them [leaders] all that France will be at the fore front of the fight against terrorism,” he said. Several world leaders including Trump, Theresa May, Justin Trudeau and Putin have congratulated the president- elect and expressed their wishes to work with him via social media. Through his twitter account, Trump welcomed the president elect. 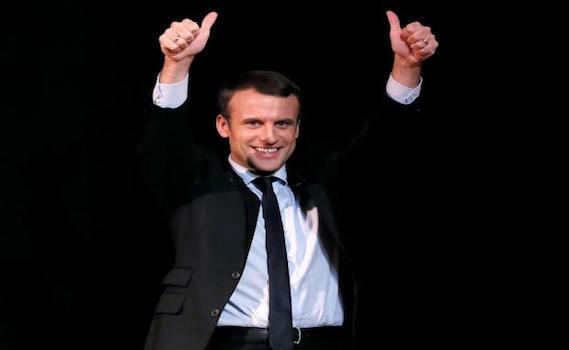 “Congratulations to Emmanuel Macron on his big win today as the next President of France. I look very much forward to working with him,” Trump said.